Faster, more powerful and dense computing hardware generates significant heat and imposes considerable data center cooling requirements. 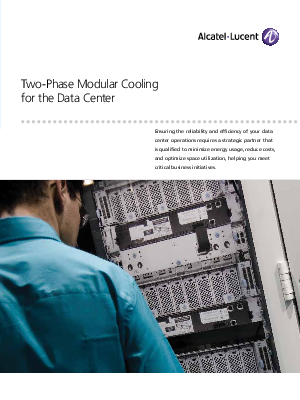 These challenges have organizations across all industries re-evaluating traditional approaches to data center cooling and seeking competitive advantage through reduced power consumption, better utilization of space, and improved eco-sustainability. The Alcatel-Lucent Modular Cooling Solution incorporates innovative technology and an end to end solution that is delivered via a single-sourced, quality-focused model built on a proven methodology. Extensive experience and Bell Labs innovation in the area of thermal design and cooling technology give Alcatel-Lucent the knowledge and leadership to act as your strategic partner in transforming data center cooling to achieve your business goals.